Between October the 28th and 30th 2016, a temporary structure was created on Semerwater stretching out into the Lake. Created to celebrate the discovery of an intact Bronze Age Spearhead in 1937. Featuring the casting of a replica bronze spearhead, music, art and poetry live events over the 3 days. Organised by the Dales Countryside Museum, Hawes. The sculpture was created by the artist David Murphy. Unscheduled landing in a front garden provokes a response from the Ambulance Service. The pilot had a lucky escape, along with the householders who had been gardening just before the landing. In 2014 the Tour de France passed through Hawes and continued onto the Buttertubs Pass and over to Swaledale. This production looks at the impact of the race on Tourism and the local population, starting from the week before the race and on the race day. 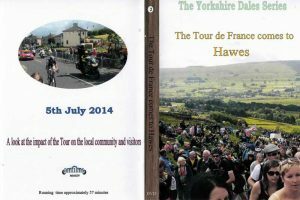 There is a short piece on the race coming into Hawes and passing up the steep climbs to the Buttertubs.